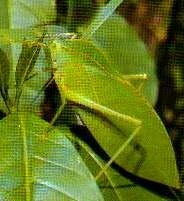 This insect has a bright green body and finely veined leaf-like wings. This provides effective camouflage amongst leafy vegetation, on which the grasshopper also feeds. In this group there are some 5000 species on earth, including the true grasshoppers, crickets and locusts.